United Nations Security Council members vote on a resolution about Yemen's security at UN Headquarters in the Manhattan borough of New York City, New York, U.S., Dec. 21, 2018. The U.N. Security Council has unanimously endorsed a deal for a cease-fire around the vital Yemeni port city of Hodeida. The agreement was reached last week during U.N.-led intra-Yemeni talks outside the Swedish capital. "The resolution endorses all the agreements reached by the parties at Stockholm," said British Ambassador Karen Pierce, whose delegation drafted the text. "These critically include a cease-fire, a mutual redeployment of forces from Hodeida city and port, and that came into force on 18 December. It authorizes the United Nations to deploy support for implementation of those agreements, including monitors." The United Nations will monitor the cease-fire and is authorized by the resolution to deploy an advance team for that purpose for an initial period of 30 days. It is being headed by Major General Patrick Cammaert of The Netherlands, a former U.N. peacekeeping commander. He already has deployed to the region. The resolution approved Friday "insists" that all parties respect the cease-fire agreed for Hodeida. A man stands amidst the rubble on Dec. 17, 2018, at a factory damaged during fighting and air strikes. The city is the entry point for 70 percent of Yemen's food, fuel and medicines, and it has been under rebel Houthi-control for the past two years, putting it in the crosshairs of the conflict. The U.N. secretary-general also is being asked to provide the Security Council with proposals before December 31 on how the U.N. plans to carry out monitoring operations. Additionally under the deal, fighters are to be redeployed to agreed upon locations outside Hodeida within 21 days of the cease-fire coming into effect. In addition to Hodeida, the parties in Sweden last week agreed to the exchange of thousands of prisoners. FILE - The leg of malnourished Ghazi Ahmad, 10, is pictured as he lies on a stretcher at a hospital in Taiz, Yemen, Nov. 3, 2018. They also came to an understanding aimed at easing the situation in the southwest Yemeni city of Taiz, with humanitarian corridors to allow safe passage of persons and goods across the front lines, as well as to reduce fighting. The council resolution endorsed these agreements. "The resolution does not address all the issues of the multifaceted crises that Yemen faces, but the implementation of the concrete measures in the Stockholm agreement will provide much needed steps in that direction, with direct and positive humanitarian impact for the people of Yemen," said Swedish Ambassador Olof Skoog. He said Sweden is ready to participate in the monitoring mission. It took several days of negotiations for the 15 council members to agree on the text. The United States and Kuwait wanted the language to stick to the points agreed in Stockholm and not extend to humanitarian and other issues. 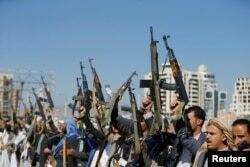 Armed Houthi followers raise their rifles at a gathering showing support for their movement in Sanaa, Yemen, Dec. 19, 2018. The United States also wanted Iran named for its support to the Houthis. At one point, the U.S. submitted its own draft resolution. "While we voted for the resolution put forward by our friends the United Kingdom, we regret that it does not call Iran to account for its destructive agenda in Yemen," said U.S. representative Rodney Hunter. "We hope that in the days to come, Iranian missiles or misdeeds do not shatter promise of peace and bring us back to where we were before." The language in the adopted resolution dropped calls in earlier drafts for condemnations of violations of the international arms embargo imposed on the Houthi rebels and the need for investigations into alleged violations of international humanitarian law. FILE - Hafidh Abdullah al-Khawlani, who survived a Saudi-led air strike stands on the wreckage of a bus destroyed by the strike in Saada, Yemen Sept. 4, 2018. A Saudi Arabian-led coalition began bombing Iranian-aligned Houthi rebels in support of Yemen's government in March 2015. Since then, the U.N. estimates more than 10,000 people have been killed, mostly due to coalition airstrikes. While there is a glimmer of hope on the political horizon, the country is still facing massive food shortages that have left millions of Yemenis starving amid a collapsing economy. The United Nations hopes to convene a second round of intra-Yemeni talks early next year.